cancer treatment | Genesis Nanotechnology, Inc.
About one in four older adults suffers from chronic pain. Many of those people take medication, usually as pills. But this is not an ideal way of treating pain: Patients must take medicine frequently, and can suffer side effects, since the contents of pills spread through the bloodstream to the whole body. Now researchers at MIT have refined a technique that could enable pain medication and other drugs to be released directly to specific parts of the body — and in steady doses over a period of up to 14 months. The method uses biodegradable, nanoscale “thin films” laden with drug molecules that are absorbed into the body in an incremental process. In the paper, published today in the Proceedings of the National Academy of Sciences, the researchers describe the method used in the new drug-delivery system, which significantly exceeds the release duration achieved by most commercial controlled-release biodegradable films. The paper was co-authored by Hsu, Myoung-Hwan Park of Shamyook University in South Korea, Samantha Hagerman ’14, and Hammond, whose lab is in the Koch Institute for Integrative Cancer Research at MIT. The research project tackles a difficult problem in localized drug delivery: Any biodegradable mechanism intended to release a drug over a long time period must be sturdy enough to limit hydrolysis, a process by which the body’s water breaks down the bonds in a drug molecule. If too much hydrolysis occurs too quickly, the drug will not remain intact for long periods in the body. Yet the drug-release mechanism needs to be designed such that a drug molecule does, in fact, decompose in steady increments. To address this, the researchers developed what they call a “layer-by-layer” technique, in which drug molecules are effectively attached to layers of thin-film coating. In this specific case, the researchers used diclofenac, a nonsteroidal anti-inflammatory drug that is often prescribed for osteoarthritis and other pain or inflammatory conditions. They then bound it to thin layers of poly-L-glutamatic acid, which consists of an amino acid the body reabsorbs, and two other organic compounds. 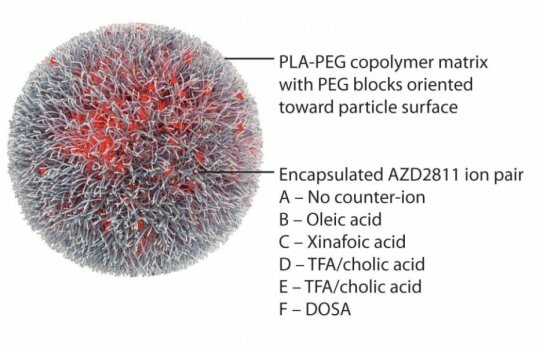 The film can be applied onto degradable nanoparticles for injection into local sites or used to coat permanent devices, such as orthopedic implants. In tests, the research team found that the diclofenac was steadily released over 14 months. Because the effectiveness of pain medication is subjective, they evaluated the efficacy of the method by seeing how well the diclofenac blocked the activity of cyclooxygenase (COX), an enzyme central to inflammation in the body. “We found that it remains active after being released,” Hsu says, meaning that the new method does not damage the efficacy of the drug. Or, as the paper notes, the layer-by-layer method produced “substantial COX inhibition at a similar level” to pills. The method also allows the researchers to adjust the quantity of the drug being delivered, essentially by adding more layers of the ultrathin coating. Hammond and Hsu note that the technique could be used for other kinds of medication; an illness such as tuberculosis, for instance, requires at least six months of drug therapy. Indeed, other researchers who have looked at the paper say the potential medical versatility of the thin-film technique is of considerable interest. To be sure, in each case, researchers will have to figure out how best to bind the drug molecule in question to a biodegradable thin-film coating. The next steps for the researchers include studies to optimize these properties in different bodily environments and more tests, perhaps with medications for both chronic pain and inflammation. A major motivation for the work, Hammond notes, is “the whole idea that we might be able to design something using these kinds of approaches that could create an [easier] lifestyle” for people with chronic pain and inflammation. Hsu and Hammond were involved in all aspects of the project and wrote the paper, while Hagerman and Park helped perform the research, and Park helped analyze the data. The research described in the paper was supported by funding from the U.S. Army and the U.S. Air Force. Many cancer patients survive treatment only to have a recurrence within a few years. Recurrences and tumor spreading are likely due to cancer stem cells that can be tough to kill with conventional cancer drugs. But now researchers have designed nanoparticles that specifically target these hardy cells to deliver a drug. The nanoparticle treatment, reported in the journal ACS Nano, worked far better than the drug alone in mice. The researchers packaged the anti-cancer drug doxorubicin into nanoparticles coated with chitosan, a natural polysaccharide that can specifically target CSCs. Once in the acidic environment of the tumor, the nanoparticles degraded and released the drug. Tests on tiny, tissue-like clumps of both normal and cancer stem cells in vitro and on human breast tumors grown in mice showed the therapy successfully killed CSCs and destroyed tumors. The mice showed no obvious side effects. Tumor reinitiating cancer stem-like cells are responsible for cancer recurrence associated with conventional chemotherapy. We developed a doxorubicin-encapsulated polymeric nanoparticle surface-decorated with chitosan that can specifically target the CD44 receptors of these cells. This nanoparticle system was engineered to release the doxorubicin in acidic environments, which occurs when the nanoparticles are localized in the acidic tumor microenvironment and when they are internalized and localized in the cellular endosomes/lysosomes. This nanoparticle design strategy increases the cytotoxicity of the doxorubicin by six times in comparison to the use of free doxorubicin for eliminating CD44+ cancer stem-like cells residing in 3D mammary tumor spheroids (i.e., mammospheres). We further show these nanoparticles reduced the size of tumors in an orthotopic xenograft tumor model with no evident systemic toxicity. The development of nanoparticle system to target cancer stem-like cells with low systemic toxicity provides a new treatment arsenal for improving the survival of cancer patients. When you take a drug, it travels through your bloodstream, dissolving and dispersing, and eventually reaching its designated target area. But because the blood containing the drug travels all round your body only a small percentage of the initial dose actually reaches the desired location. For over-the-counter drugs like paracetamol or ibuprofen, with very few side-effects, this doesn’t matter too much. But when it comes to cancer drugs, which can affect healthy cells just as much as cancer cells, this process can cause big problems. Partly because drugs are diluted in their blood, cancer patients need to take these drugs in particularly high doses – and this can cause seriously unpleasant side effects. But Professor Sonia Trigueros, co-director of the Oxford Martin Programme on Nanotechnology, is inching closer to developing a nano-scale drug delivery system with the aim of specifically targeting cancer cells. Working with a team of chemists, engineers and physicists, Trigueros has embarked on an ambitious mission to tackle cancer at the ‘nano’ level – less than 100 nanometers wide. For context, this is super-tiny: a nanometre is a thousandth of a thousandth of a millimetre. There’s still a long way to go, but Trigueros is making decent headway, and has recently tackled a major problem of working at a nano level. And at this year’s Wired Health conference – which looked at the future of health care, wellbeing and genomics – she told us about her recent progress, and her visions for the future. Some of us will remember the periodic table displayed in our science classrooms which told us about the properties of each element. But working on a nano level everything changes, and elements behave completely differently. Elements have different properties at the nano level than they do at the micro level, explained Prof Trigueros to the Wired Health 2015 audience. This poses big problems for researchers trying to make nano-scale devices, which can be made out of a number of different materials, including gold, silver and carbon. All these materials are highly unstable at the nano level. This isn’t ideal, considering our bodies are made up mostly of water. Trigueros’ recent work has focused on trying to stabilise tiny tubes made of carbon, called carbon nanotubes, which hold drugs inside the tube so they can be delivered into cancer cells. She has now found a way of keeping them stable for more than two years and in temperatures up to 42ºC. To do this, she wraps DNA around the structures, like a tortilla wraps around the fillings of a burrito. While this accomplishes the goal of keeping the nanostructures stable inside the body this doesn’t do much good if the DNA can’t unwrap to deliver the drugs. But, according to Trigueros, she has shown that, once inside a cell, the DNA easily unwinds and releases its payload. So how does it all work? How do the drugs get into the cancer cells? Trigueros’s nanotubes exploit the differences between cancer cells and healthy cells – in this case, differences in the membranes that hold them together. “Cancer cells are more permeable than normal cells so the nanotubes can get through the cell membrane. And once they are in, they unwrap and deliver drug,” explained Trigueros. Exploiting differences in their permeability is one way to target the cancer cells, but Trigueros explains that there is more than one way to create a truly targeted drug delivery system. “We can attach whatever we want on DNA,” she said. “So you can attach a protein that recognises cancer cells”. While this all sounds great in theory, will it actually work in reality? Trigueros has now started preliminary tests on laboratory grown lung cancer cells, she told us during an interview. And this has shown tentative promise, she says, citing unpublished data on their effectiveness at killing these cells in the lab. Others are cautiously optimistic. “This is a really exciting prospect,” says Professor Duncan Graham, nanotechnology expert and advisor to Cancer Research UK. In theory, once Trigueros’s nanotubes have finished their job they are tiny enough (50 nanometres) to be excreted through urine. This isn’t the first time carbon nanotubes have been used in cancer research: a US research team has used them, for example, to target and collect images of tumours in mice. But the combination of drug delivery and cancer-specific targeting is what interests Professor Graham. 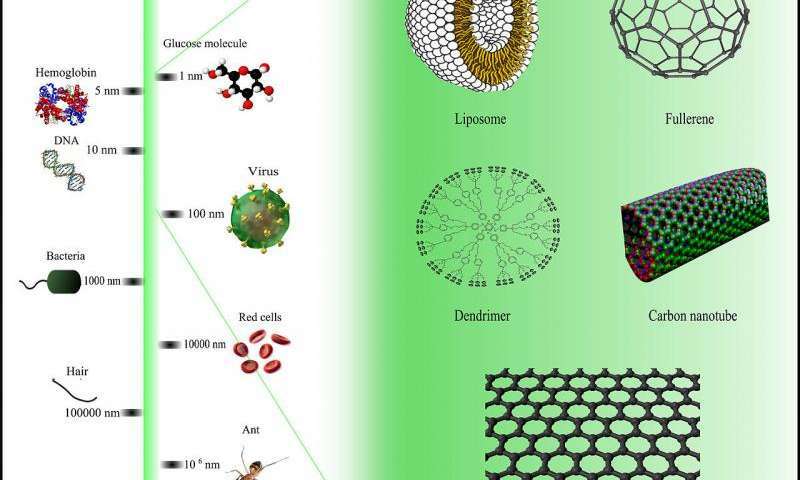 “Unlike previous work using carbon nanotubes, this approach is set to target the tumour specifically, potentially meaning fewer side effects and a lower dosage. I look forward to seeing this in animal models which is where the real proof of activity lies,” he said. But he’s cautious, stressing that Trigueros’s work has not yet been peer-reviewed and published. Next Trigueros is aiming towards starting animal trials and, eventually, she wants to begin clinical trials in patients – that is if everything goes well. She hopes to focus on how nanostructures could be used to cross the blood-brain barrier – the brain’s highly selective ‘bouncer’ that only lets certain molecules across. This has been notoriously difficult to get past, making targeting cancers in the brain more difficult. But there is a still a long way to go and a lot of problems to tackle. In the shorter term, we’ll be keeping an eager eye on her drug delivery research, as her ideas continue to develop.